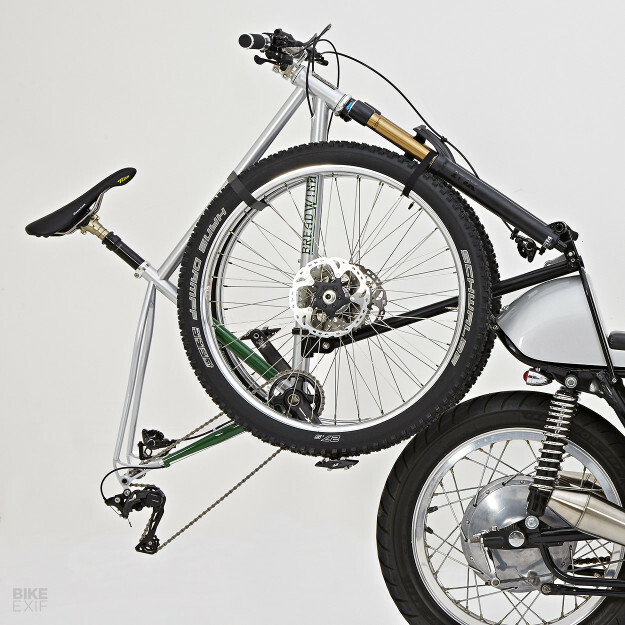 Ever wished your motorcycle could carry a pushbike to your local trails? So did Oregon man Tony Pereira—so he tricked out his motorcycle with a very clever removable bike rack. Even though bicycle-making is his day job, Tony’s been wrenching on motorcycles for a lot longer. 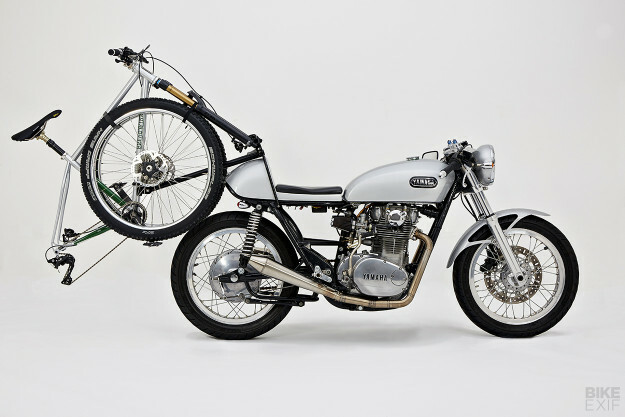 This XS650 is his daily rider, and he’s been fettling it for 16 years. 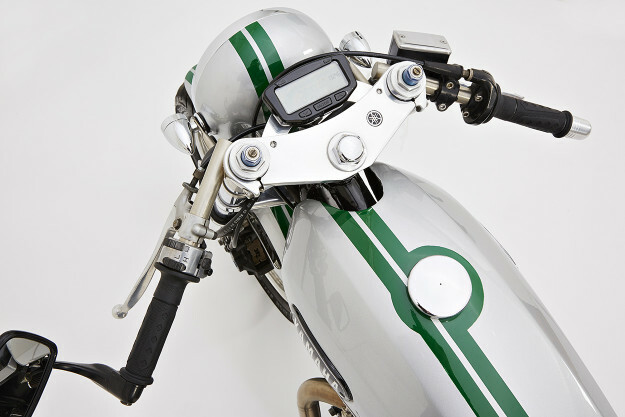 “So I jumped in my pickup, went over and slid the rusty mess of a bike in on its side, thinking I’d only ever use it as a parts bike.” After a year of pillaging random parts from it, Tony decided to build his first café racer. 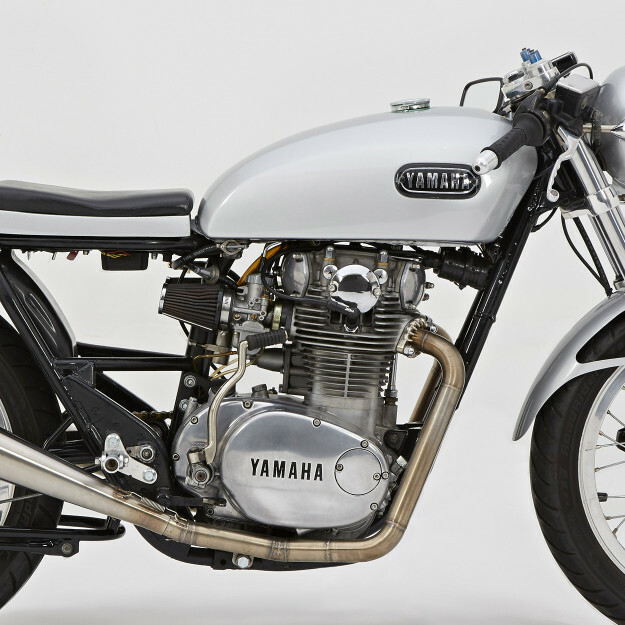 It took Tony three years to get the XS650 restored, customized and back on the road. 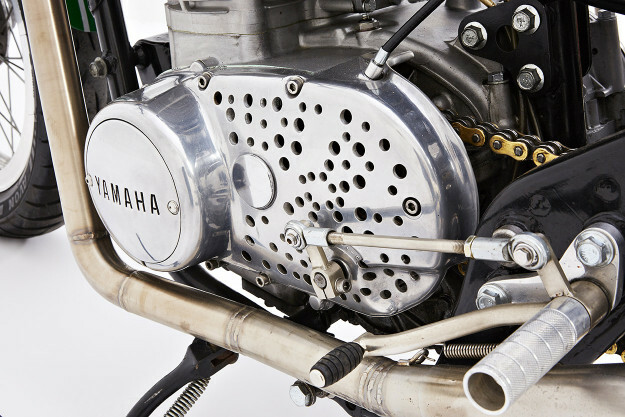 The initial resto saw the engine rebuilt and bored out to 700cc, and the carbs upgraded to Mikuni VM34s. He got enough orders to quit his day job and go at it alone, eventually partnering up with Ira Ryan a few years ago to form Breadwinner. Which is where he got the idea for the bicycle rack. 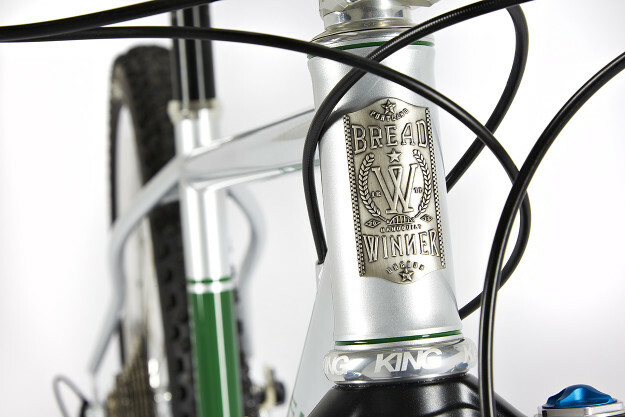 The rack’s removable, and is made from 4130 tubing and some bicycle seat binder braze-ons that Tony had lying around. 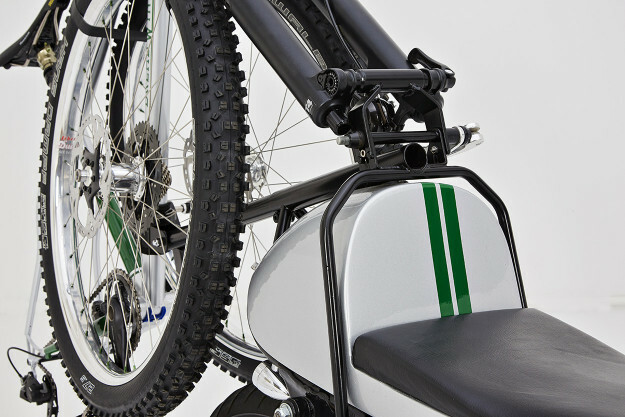 It went on round about the time that the bike got repainted, with the stunning white and green livery you see here. 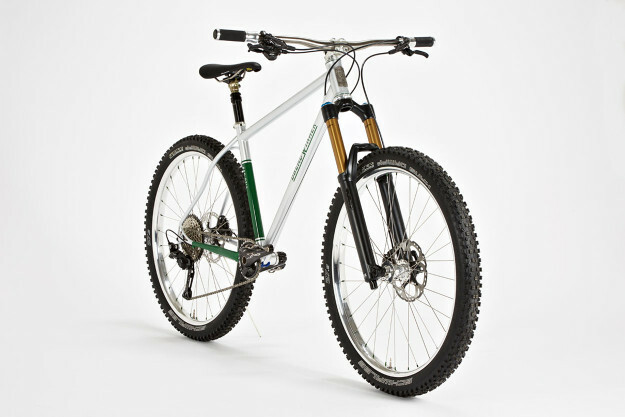 Bad Otis recently got the same treatment, so that the guys could show the pair off at their booth at this year’s North America Handmade Bicycle Show. 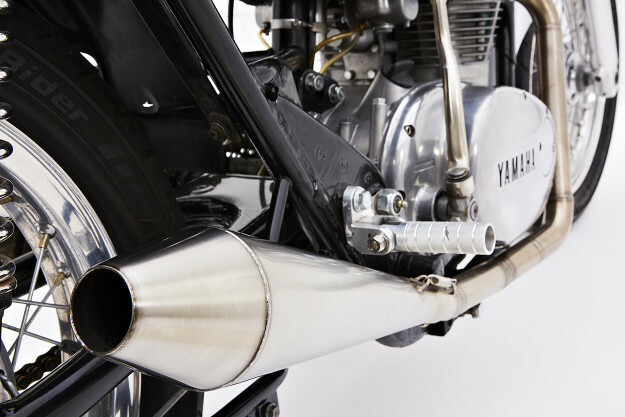 The rest of the XS650 is worthy of closer inspection too. Tony recently ditched the stock forks and brakes in favor of a 2002-spec Yamaha R6 setup. There’s also a Kawasaki Ninja 250 master cylinder and an EBC rotor. There’s a new wiring system too, kitted out with a Hugh’s Handbuilt PMA and a Sparx battery eliminator. The speedo’s a digital affair from Trail Tech. 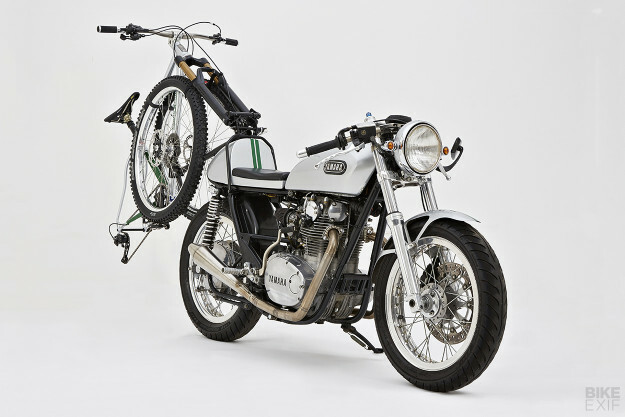 These days, this XS650 rolls on 18-inch DID Akront-style rims: Tony made the switch from the stock 19-inch front wheel to help quicken the handling. The tires are Avon AM26s, and the rear brake drum is a larger unit from an XS750. The XS is stacked with lovely details—like the hand made clip-ons, drilled cover and selective use of nickel plating. 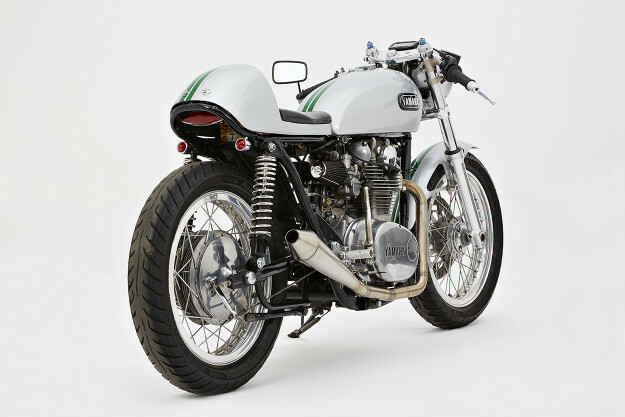 The fender is a Motocarrera TZ-250 item, and the rear-sets are modified Spec II units. 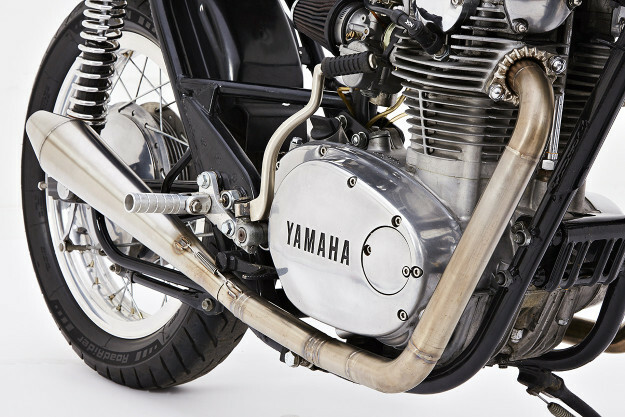 Tony also built the exhaust system himself, using parts from Cone Engineering.